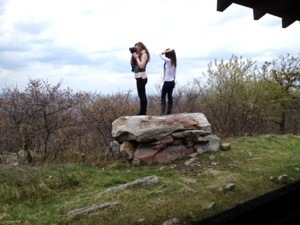 Rutherford Shelter, N.J., AT NOBO mile 1329.7, Saturday May 10, 2014 — Today was all about nature, human and otherwise. First, last night Swayed, Bus, Maglev (the nurse) and I were at a shelter with two young women from Rheinlander, Wisconsin. They were. It only a total delight, but a hoot as well. It’s been a long time since I’ve met anyone that genuine. The girls are on a six week southbound section hike for all the right reasons. Adventure and discovery will punctuate their personal growth. May the wind be at your back ladies. Today’s hike was rocky enough that we thought we’d taken a detour back into Pennsylvania. The rocks will thin out permanently within the next 100 miles or so. Not going to fret about them. 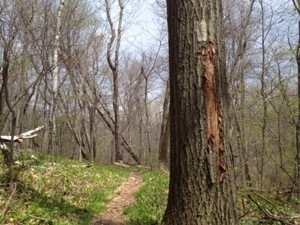 We discovered where a bear had been making its own blazes. I only wish humans could to that well. We spent two hours this morning chasing the trail due to some poor and unconventional marking techniques. Later we encountered some tourists near a parking lot. “No, I didn’t see any bears today!” I need a sign to put around my neck to answer that ubiquitous interrogative. 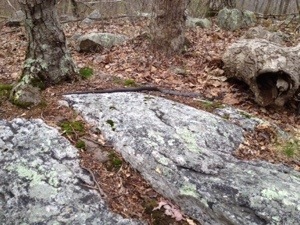 A funny black snake which had a payday crossed the trail. He was pretty slow, being fat in the middle. Once his head was hidden, he stopped trying to get away thinking we could no longer see him. 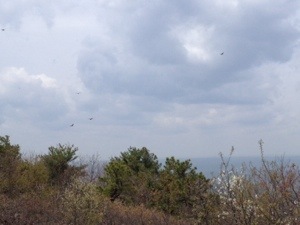 Also watched some red tailed hawks trying to make their living. How’s the weather? We’re having snow flurries today which seems totally unnecessary. Hope you’ve got sunshine glinting off those rocks. 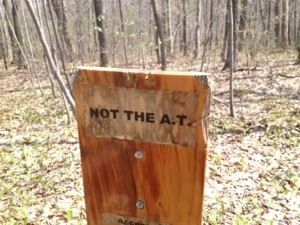 A huge part of the AT is the people you meet!!!!! Hope you clear rocks soon. My foot is almost healed.